This article provides an update on cattle intestinal worms in the Northern Territory (NT) and advice on management for long-term control. ☑ Intestinal worm control is the 2ndhighest-ranked animal health treatment on NT cattle properties. ☑ For longterm effective intestinal worm control integrated pest management should be considered. The latest NT-Wide Pastoral Industry Survey shows that cattle intestinal worm control was the second most frequent animal health treatment used on NT pastoral properties. Only botulism vaccination was ranked higher. In the Alice Springs region, intestinal worm control ranked as the equal-3rd most used treatment. An extract from this survey is given in Table 1. Intestinal worms of three species (Cooperiaspp., Oesophagostomum sp. and Haemonchus sp.) are endemic in cattle herds of the NT. Projects during the past five years have demonstrated the presence of significant worm egg counts (over 500 eggs per gram) (epg) in the faeces of young cattle (est. 6 to 18 months old) in northern and southern herds of the NT. Research in the Alice Springs region has recorded worm egg counts over 700 epg in weaner cattle after drought-breaking rain (Coventry 2013). 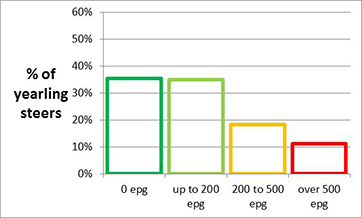 Comparable ranges of worm egg counts from the latter projects are shown in Figures 1 and 2. Disease caused by intestinal worm infestation in cattle may not always be obvious. Anecdotal reports and field observations suggest that the risk may be increasing in the Alice Springs region (see Box 2.). Subclinical infestations can have a negative impact on cattle growth performance, so combination of management strategies should be undertaken to reduce the cost of intestinal worm control and the long-term cost to cattle production. Programs that co-ordinate several different management strategies for economic control of parasites are known as integrated pest management (IPM). ☒ undeveloped immunity in weaner cattle. Presentations in 2016 by Australian veterinarians (AVA 2016) have highlighted the increasing risk of developing ‘super worms’ that are resistant to common worm treatments (anthelmintics). These could be a concern in cattle imported from properties that routinely and frequently use worm treatments. Use of IPM can reduce the risk of anthelmintic resistance. Table 2 (below) has been compiled with the help of veterinarians from some of the Australian companies that produce cattle worm drenches and pour-on treatments. This table addresses the ‘hows & whys’ of IPM, i.e. why laboratory testing or on-property investigations can provide vital feedback to develop and review a property–based IPM plan. For more information on IPM, or to discuss IPM issues for a property–based plan, please contact your regional veterinary officer. For the Alice Springs and Barkly regions, phone 08-89518181. Coventry, J. (2013). Review of aspects of breeding herd performance from beef cattle projects on the arid rangelands of the Alice Springs district, Master’s thesis by research, Murdoch University, (online) available at: http://researchrepository.murdoch.edu.au/18322/. Cowley, T., Oxley, T. MacDonald, N. Cameron, A. G., Conradie, P., Collier, C. and Norwood, D. (2015). The 2010 Pastoral Industry Survey – Northern Territory Wide. Northern Territory Government, Australia, 86 p., (online) available at: http://www.nt.gov.au/d/Content/File/p/pi/PastoralSurvey/PastoralSurvey_ntwide_2010.pdf. Streeter, S., Perkins, N., Cowley, T., MacDonald, N. (2014). Causal factors affecting variation in liveweight gain in north Australian beef herds, Final Report B.NBP.0390, October 2014, Meat & Livestock Australia Ltd, North Sydney NSW, 379 p., (online) available at: http://www.mla.com.au/Research-and-development/Search-RD-reports/RD-report-details/Productivity-On-Farm/Causal-factors-affecting-variation-in-liveweight-gain-in-north-Australian-beef-herds/1684. The Australian Veterinary Association (2016). From the AVA President: Ivermectin – scratching beneath the surface, (online) available at: http://www.ava.com.au/13561. Tincknell, J. and Coventry, J. (2014). Intestinal worms are an issue for cattle in Central Australia, Alice Springs Rural Review, Department of Primary Industry and Fisheries, Volume 58 December 2014, pp.8-9., (online) available at: http://www.nt.gov.au/d/Content/File/p/NL/ASRR/asrr2014_12.pdf. Immunity Build cattle immunity with good genetics and good nutrition. Focus cattle selection and breeding on a balance of genetics for both growth rate and resistance to parasites. Respite Give weaners respite from intestinal worm challenge while they develop immunity. Remove weaners from paddocks with bulls. If required (e.g. 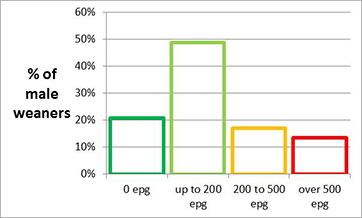 average faecal egg count greater than 100 epg), treat all weaner cattle at weaning with a long-acting product and put onto fresh/ spelled pastures. Grazing Management Strategically stock and spell pasture. Don’t over-graze. Over-grazing may result in ingestion of more immature worms (larvae). Refugia If under threat of ‘super-worms’, consider use of the ‘refugia’ concept. ‘Refugia’ are untreated home-bred stock with immunity to the local type of intestinal worms. Co-grazing with this stock enables the local worms to dilute and prevent establishment of a population of ‘super worms’. Quarantine Treat introduced cattle during initial quarantine with short-acting anthelmintic. A short acting anthelmintic assists surviving (imported) worm larvae to be filtered or diluted by the property’s local type of worms (ref. ‘refugia’ above). Faecal Testing Undertake faecal egg counts and larval culture on cattle up to 18 months old. Laboratory test results help to plan an individual property-based IPM program and get an annual/ biennial snapshot of the herd/paddock status.